Last week’s shuttering of Google Reader left millions of newshounds searching for alternative RSS-based news reader apps. Why? Many consumers don’t subscribe to RSS news feeds, and instead get their news from social media like Facebook, Twitter and LinkedIn. They log in to these sites each morning and, from the sea of photos and personal status updates, find news stories posted by friends and others in their networks. Popular mobile apps like Flipboard and Zite are a testament to the draw of social, personalized news. Even Facebook is reportedly experimenting with some form of news reader. Over the past week, I’ve been exploring news apps that leverage your social ties to deliver the news. There are many out there, but two stood out to me: Newsle and Nuzzel. They’re alike in a few ways, beyond their similar-sounding names. They’re both free to use, and are Web-only for now. They both aim to de-clutter your social news feeds by plucking out the top-shared or most relevant news stories for you. But they’re different in concept: Nuzzel is about the news your friends share, and Newsle is about your friends being in the news. So, Nuzzel might show you the top news story your Facebook and Twitter friends are sharing about the Asiana Flight 214 crash in San Francisco; while Newsle will show you the top story about your successful entrepreneur friend in the news, or pull up an article in which a colleague was mentioned. Of the two, I found Nuzzel more useful, but it comes with a catch: It’s currently in beta, and available to a limited user base, though new users can request access on its website. It will become more widely available in the coming months. I liked Newsle, too, but my social feeds are filled with a lot of newsmakers, not to mention fellow journalists — so I had to wonder what Newsle would look like for someone who’s not a self-proclaimed media wonk like me. My news feed felt pretty narrow in scope. 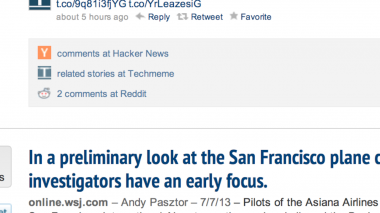 Newsle actually launched a couple years ago, but has gained more traction over the past year. It now has 100,000 users and “tracks” 50 million people, which means it surfaces news stories about all the people in the networks of those hundred thousand users. I signed up for Newsle through Facebook Connect, and then connected my LinkedIn account. Newsle promises never to post to your Facebook or LinkedIn pages without explicit permission, unlike spammy apps that slip in a permission slip when you first sign up, and then post on your page at will. You can also connect your Gmail account to pull in contacts’ information and widen your Newsle feed, but the site currently doesn’t support other email services, like Outlook. When I only read my Friends feed on Newsle, I felt like my world was pretty small. Aside from one article about unrest in Egypt, and another update on two Brooklyn subway stations, almost every article in my feed was about tech or digital media. Some were from sources I trust or normally read, but others were from more obscure websites. When I expanded to Friends of Friends or Everyone, the news topics broadened. There were two world-news articles, one about U.S. jobs data, and another about Edward Snowden’s quest for asylum. 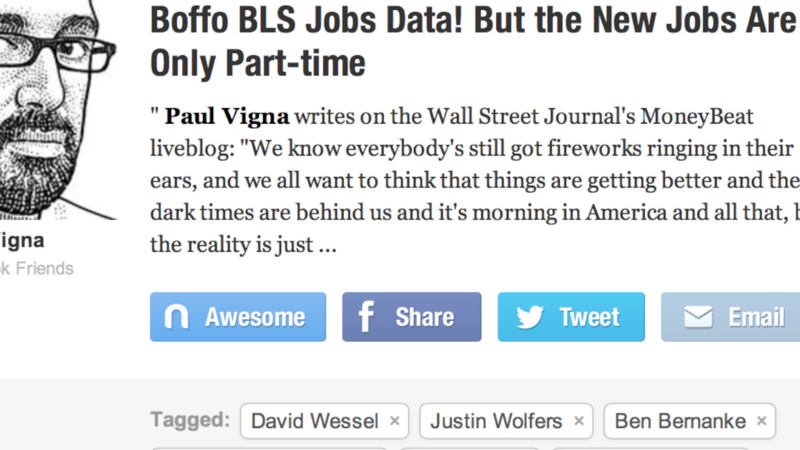 It’s easy to share articles from Newsle by simply clicking a Share button, but the Newsle Awesome button is sort of arbitrary. The company envisions it being similar to a Facebook “Like,” but right now it’s unclear what that button really does. Newsle also auto-creates profiles for users, and you can follow these people as you might follow a Twitter friend or subscribe to someone on Facebook. 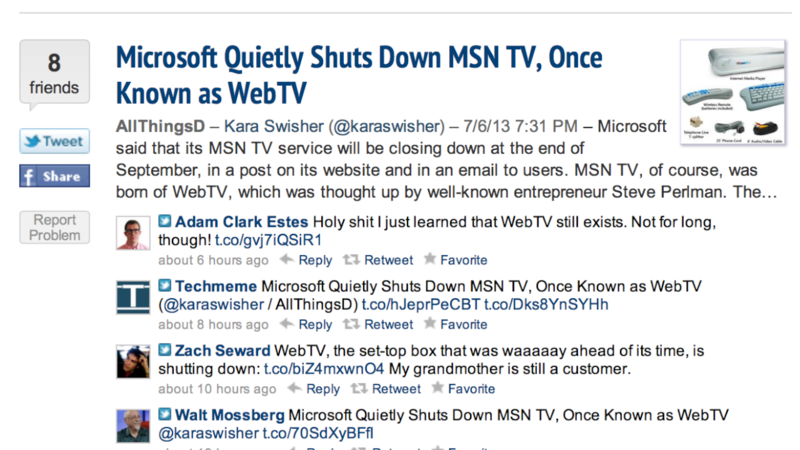 There are a few obvious drawbacks to Newsle. The first is that the site doesn’t link to Twitter. You can still see other users’ Twitter feeds on Newsle — for example, when I went to look at my boss Walt Mossberg’s Newsle profile, his recent tweets appeared on his page — but Newsle isn’t using your Twitter contacts or data as reference points. 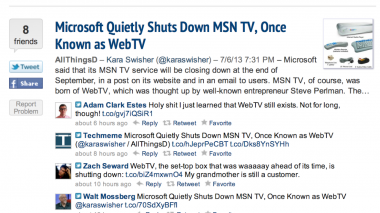 Newsle says Twitter integration will launch when Newsle has a mobile app. To that point, Newsle doesn’t have mobile apps. I did access Newsle from the mobile Web browser on my iPhone, but the experience was less than ideal. Newsle’s co-founder says an iOS app is coming this summer. Lastly, Newsle as a service confuses who is in the news versus who is writing the news. For example, Newsle uses regular email alerts to let users know when something newsworthy has come up, the way Google Alerts works. Most of the time, the email alerts I got were pointing me toward articles from AllThingsD — because the article included my own bylines or those of my colleagues. Nuzzel, on the other hand, connects to both Twitter and Facebook. 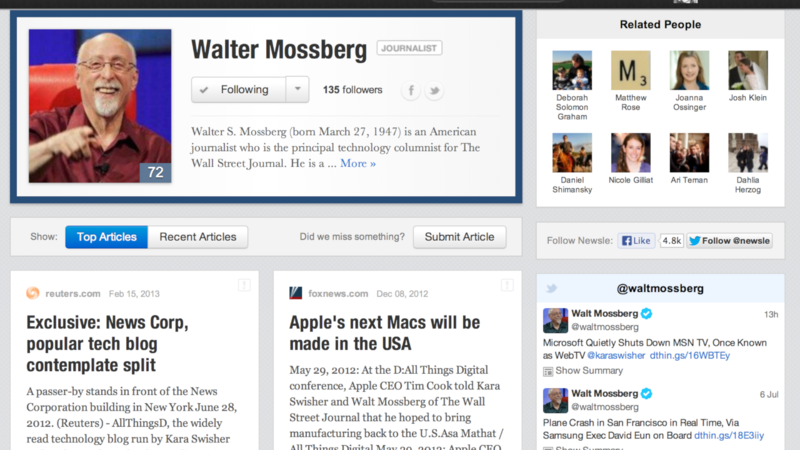 Nuzzel’s news feed is slightly more utilitarian in design than Newsle’s, but it adds more context to each post. 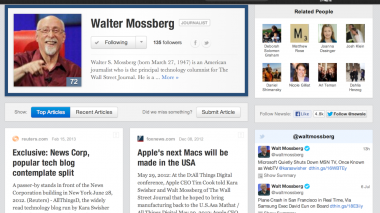 For example, Nuzzel will show a main news story, like “Douglas. C Engelbart, Inventor of the Computer Mouse, Dies at 88,” and below it, a handful of interesting tweets from my Twitter friends about the same story. 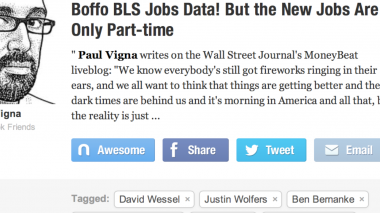 Below that, there are sometimes links to other aggregators. 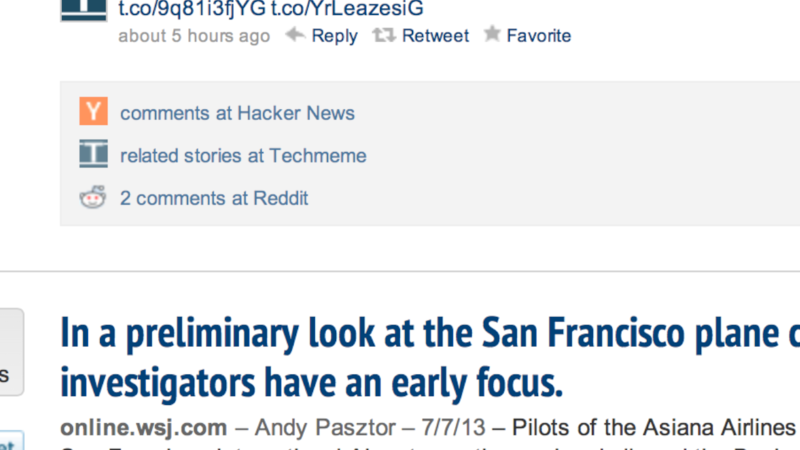 Many of the stories in my feed included a “Read more on Techmeme” option. The Engelbart story also pointed me toward 13 related comments on Hacker News and two comments from Reddit users. Overall, I found this to be a richer news-reading experience. The tweets and supplemental sources are interesting. Most importantly, the news isn’t just about my friends or friends of friends. The Nuzzel email alerts were more interesting, as well. Nuzzel, like Newsle, currently doesn’t have optimized mobile apps, but my Nuzzel experience on a mobile Web browser wasn’t unpleasant. And the company is readying an iOS app for launch. Nuzzel has become a go-to site for me. Newsle, I think, could stand to fine-tune its algorithm. Both apps nudge consumers toward the future of social news reading, with a little more flavor than straight-up RSS feeds, and far fewer food photos than on Facebook.